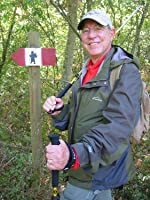 Alan Champorcher is seen here hiking the Via Francigena doing research for his new book, "The Italian Mission." The author of "Made In Italy" returns to the bel paese for a high voltage adventure story. John Adams Conti, a disillusioned ex-CIA agent, languishes in a low level diplomatic job at the American Embassy to the Vatican. An old Buddhist monk, familiar with Conti's distinguished family pedigree, asks him to help protect a mysterious young Tibetan on the run in Italy from Chinese intelligence agents. Teaming up with his ex-colleague and old flame, Conti joins a wild chase along an ancient pilgrimage route through the Tuscan hills. Along the way, they must duel not only the Chinese, but also South African mercenaries and hostile mafia families. When they discover the identity of the young Lama, the hunt becomes a race against the clock with the future of Tibet at stake. Get your copy now! Please enter your email address and click the Follow button to follow Alan Champorcher!